ONDESE Travel & Safaris invites you to peaceful, colourful, contrasting and breathtaking southern Africa! 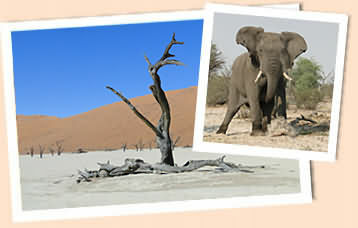 ONDESE Safaris invites you to peaceful, colourful, contrasting and breathtaking southern Africa! Numerous game parks, conservation and wilderness areas offer the visitor a fantastic variety of African wildlife. Excellent accommodation, African hospitality and our love for and devotion to this region ensure an exciting, comfortable and safe journey. Discover Namibia with its oldest desert in the world, the Namib, the lush Zambesi Region in the Caprivi strip, the beautiful and slow-flowing Okavango River, the wildlife of the famous Etosha National Park, ancient mountains with age-old rock art, the breathtaking Fish River Canyon, the red sands and the park-like landscapes of the Kalahari and the Kaokoland. Experience the great Victoria Falls in the unspoilt Zambesi River. Discover Botswana with its natural plethora in the Okavango Swamps, unique Chobe National Park, Moremi Wildlife Reserve, vast, white Makgadikgadi Pans and its wild middle Kalahari. Visit South Africa with its inviting South Coast, merry Cape of Good Hope, green hills of KwaZulu-Natal and its legendary Kruger National Park. 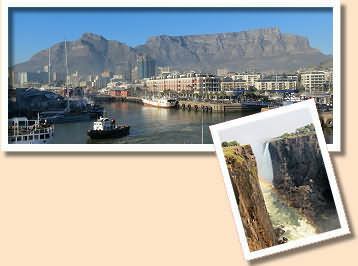 Southern Africa offers a magnificent bird-life, ancient traditions, vibrant cultures and lively cities! The travel possibilities, the combinations of various destinations in southern Africa are boundless, limited only by available time and recourse. This website is designed to give you an overview of safari possibilities in the subregion, by providing sample itineraries for Namibia, Botswana, the Victoria Falls and South Africa. These can, of course, be lengthened or shortened, combined or changed to suit your individual needs and tastes. It is our policy to incorporate your travel suggestions and adapt itineraries to fit your personal and individual needs. ONDESE means Honey Badger (Mellivora capensis). Our logo animal is a little mammal, though rarely encountered, it is found throughout southern Africa and is famous for its courage, good taste and sense of smell. ONDESE SAFARIS was founded in 1993 by its Namibian owner Friedrich Nauhaus as a Safari Operator. Thus this business is looking back on 25 years of professional experience in southern Africa. Welcome to Mendes Vinte, who joined as business partner in August 2018! We plan diverse, exciting, exclusive and always tailor-made Self-Drive Safaris (designing itineraries, booking car rental, accommodation and activities), and we organise Photo-Safaris - including Fly-In Safaris - with experienced and specialised guides, all tailored to your individual needs. Professional travel consulting will make travelling our region a pleasure! ONDESE SAFARIS functions as a booking office for Lodges, Guest Farms, City Tours, Balloon flights, Canoeing, Wild-Water Rafting, Rail Safaris, Bird-watching Trips and Horse-Riding. From Namibia we organise safaris to tourist attractions locally as well as in Botswana, to the Victoria Falls, South Africa and Swaziland and combine safaris to these countries. We shall also book only accommodation or rent a vehicle for you. We support the concept of Ecotourism and strive to sustainably conserve the balance of the environment and culture of this stunning region for future generations. We encourage travelling in small groups to ensure that each client receives the best possible service. We do not organise any scheduled tours, where strangers share the same vehicle, neither do we book camp-sites nor do we arrange camping safaris. For your exclusive travel requirements and bookings do not hesitate to contact ONDESE SAFARIS and follow the adventurous Honey Badger - the best nose for the best spots in southern Africa since 1993! Your expert partner for tailor-made travel in sunny Namibia, Botswana, South Africa, to the Victoria Falls and the rest of southern Africa!